There's not a lot of religion in "Unkept Promises," a prohibitionist comic book published in 1949 by a group calling itself the Legion of Truth. A lot the energy behind anti-alcohol campaigns in America have come, traditionally, from Protestant groups trying to make society a better place. Yet, in this very late prohibitionist tract, any references to Protestantism or even religion more generally are almost entirely absent. There are not even any ministers shown preaching against alcohol -- instead it's secular authorities. The narrator is a social worker. There are two judges, one handling criminal cases and another civil, and they both speak to the social affects of alcohol. There's the director of a women's prison and a representative from the state's "safety council," but no ministers. The church is associated with the American dream of home ownership, that mid-century dream of car ownership, and the middle class family ritual of the family portrait. The church is a white edifice with a steeple and stained glass, with big, broad stairs at the end of a curving walk way under leafy trees. 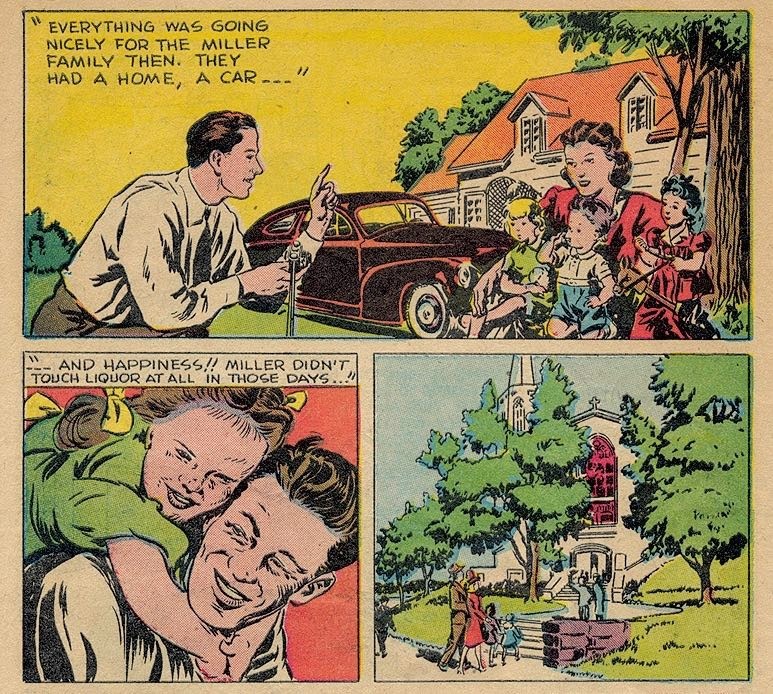 It is, in this 1949 comic, a bare symbol of middle class respectability. Culturally, here, the church doesn't stand for a solution to a social problem. It certainly doesn't communicate any particulars of believing. Instead, it's a symbol of belonging -- specifically class belonging. It represents an aspiration, something one can obtain. If you're good enough, the message goes, you can have this. If you have the strength of character, you can earn this good life.
" ---AND HAPPINESS," as the comic says. Is this fact unrelated? In 1949, more than 60 percent of Americans told pollsters they attended church or synagogue every week.